Grant Morrison and Jim Lee on WildC.A.Ts was a dream come true. Grant could let his imagination run rampant, unhindered by the restraints of working with icons, and Jim Lee got to return to his own personal creations; the C.A.Ts - and show everyone exactly how Grifter should look. Issue #1 came out in '06 and almost four years on, they still tease us with the notion of issue #2. Enduring a wait like that you need some decent reading material. 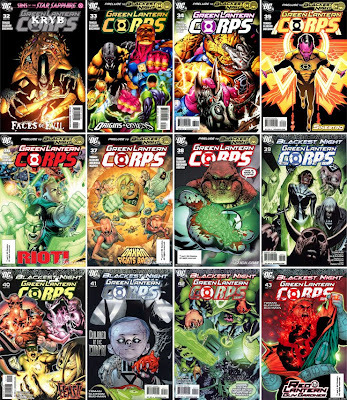 DC's Green Lantern Corps showed exactly what you can pack into a monthly comic when you've got the willpower. From the cosmic to the intimate, Pete Tomasi's words and Patrick Gleason's pencils pulled out some of the years biggest hits - taking 4 out of 12 'Panel-Beater' awards for comic of the month, right here on It's a Dan's World. Exactly how much did they get into 12 issues? Try Mongul's take-over of the Sinestro Corps, Kryb, Kyles love-life, artistic block, death and rebirth, Sodam Yat's self-sacrifice to save a home-planet full of fascists, the dead rising, Sinestro, Scar, and Guy turning red - really red. Face it, Green Lantern Corps is no-ones 'secondary GL title'.